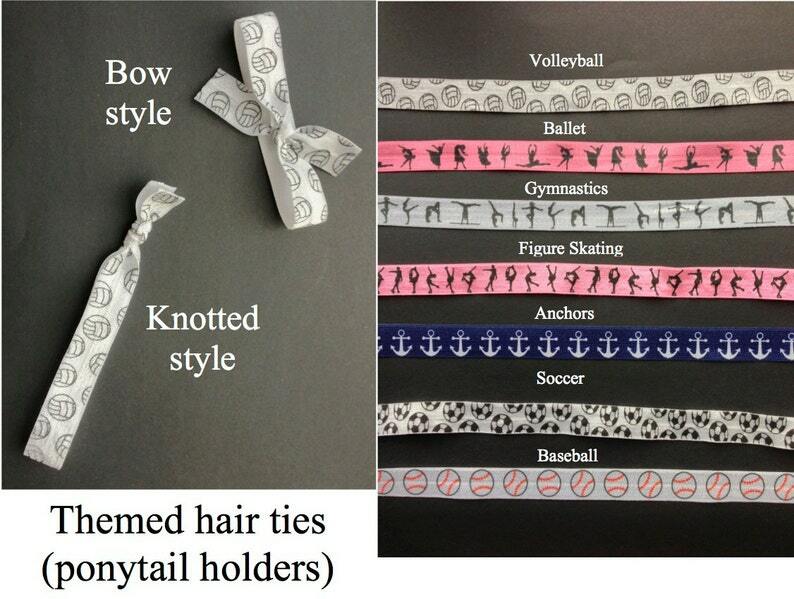 These fashionable themed hair ties (ponytail holders) come in several prints and 2 different styles. They can also be used as bracelets (up to approx. 8 inch wrists) when you want to let your hair down. The hair ties are all made of 5/8” fold-over elastic. Football, softball, and basketball are also available. Please look at all of the images in this listing to see the themed options that are available. If you would like to mix solid colored ties with themed ones, please send me a custom order request. Pictures of solid colors are available in the regular hair tie listing at https://www.etsy.com/listing/162058067/colorful-handmade-elastic-hair-ties-bow. If you would like a combination of bow and knotted hair ties, please specify which style next to the colors at checkout. Colors may vary slightly in person from the pictures due to different dye lots and color variations on technology screens. Ends are heat treated to avoid fraying. These ties are made in a smoke-free and pet-free home. If you are interested in larger orders for sports teams, cheer or dance squads, sororities, or other organizations, please contact me for a special order. These hair ties are not intended for use by children under the age of 3. Terrific product. Now when my kitty decides to knock my book off the table I won’t lose my place. These bookmarks stay in place. Well made. Jamie is great to work with. I accept credit cards and Paypal through Etsy's direct checkout system. Items must be paid for before I begin work on the items. Residents of the State of Colorado will be charged sales tax. It is important for you to be satisfied with your purchase. If you are not satisfied with your purchase, please contact me upon receipt of the item(s). You will need to return the item(s) in the same condition they were sent to you as well as pay return shipping costs. I will exchange the item(s) for equally priced item(s) in my shop. Custom orders may not be cancelled, returned, refunded, or exchanged due to the individualized nature of the items. Photography prints and photo greeting cards will be sent in a protective photo sleeve inside a rigid photo mailer. Accessories will be in a drawstring organza bag and/or cellophane bag and mailed inside a mailing pouch. All items will be sent by USPS First Class Mail. If you would like your items sent via Priority Mail or with insurance and/or confirmation, please send me a message and I can give you a quote for those additional services. I will send the item(s) you purchase to your Etsy address. If the purchase is a gift, please make sure that the recipient's mailing address is the mailing address at checkout. I am happy to do custom orders. Please contact me if you would like a larger photograph print than what is offered in my shop and I can quote you a price. All art work copyright of Just by Jaime (Jaime Saunders Archer). No photo shall be copied, resold, downloaded, or used for any commercial or personal venture without my approval. The items that you purchase from my shop are not intended for resale.